Susanne Vielmetter Los Angeles Projects is thrilled to announce the opening of our second exhibition of new work by New York-based artist Ellen Berkenblit. Berkenblit is known for her bold graphic paintings, defined by an ever-evolving pictorial calligraphy that includes a long-nosed woman in profile (sometimes a witch, sometimes a youthful beauty), a rather tame tiger, little birds, high-heels, five-petaled flowers, lipstick tubes, a manicured hand, etc. While these forms are suggestive in their familiarity and often associated with a classical notion of femininity, Berkenblit deploys them as intuitive reflections of her physical experience of the world, filtered through her body and emerging in composition: in Berkenblit’s paintings, these figures are transformed into abstractions – shape, line, color, direction, scale, orientation, texture, value—interacting within the boundaries of the canvas. Berkenblit’s new paintings reflect a quantum leap in her calligraphy; both through the addition of new terms and the way in which these terms are rendered. Until recently, Berkenblit’s paintings were composed primarily through linear means: Shapes, boldly outlined, moving in dynamic diagonals across a very flat pictorial space. In the newest paintings, suddenly shapes are voluminous and the space within the picture deepens. This subtle swelling into the suggestion of dimensionality is a direct effect of the artist’s nuanced approach to color relationships. Mixing paint as she works, each area of “solid” color intentionally reveals micro-inconsistencies in value, hue, and application. These subtle shifts in color, which have always existed in Berkenblit’s work, now suggest volume as well as providing the opportunity for a close examination of color relationships, paint handling, and their emotive affects. In no sense is Berkenblit now composing pictures that function as windows into a realistic space, instead the movement of each shape across the canvas appears layered, as though there are many parallel, planes of space that overlap in the space of each picture. This new approach to space and form has emerged organically and slowly over the last two years as Berkenblit painted in her studio. Berkenblit works on many paintings simultaneously, in tandem with her intimate knowledge of the weight, fluidity, and inclinations of her pigments and supports, she channels her approach to painting, which is deeply determined and technical, while also leaving space for the subconscious pings that lead to the dream-like suggestiveness of her visual vocabulary. This exhibition of new paintings includes works on canvas in addition to works on patterned “quilts” of calico fabric. Berkenblit’s use of patterned calico parallels her use of paint—she stitches the calico together, considering the relationships between color and pattern, a sort of puzzle of compliments and contradictions. Then the joined fabric is sent out to be stretched, after which it returns to the studio as a familiar, but unfamiliar problem to solve, this time through painting. Like the images that compose her visual language, Berkenblit tries to let these relationships, between fabrics and paint and pattern, reflect a sub-conscious yet active transformation through her intervention. The inclusion of sweet floral patterns and domestic ticking stripes draws additional attention to the assumptions that one may make about the forms that populate the work. Female bodies, trucks, traffic lights, shoes, flowers, lipsticks, a manicured hand—all are rather mundane images that might appear in a casual doodle along the side of a young person’s class notes. In Berkenblit’s hand they undergo a certain alchemy, she doesn’t entirely drain them of their content and associations, but their logic becomes the logic of dreams and of the body. These shapes repeat through a gestural, physical expression: reach of the artist’s arm, the flick of her wrist. 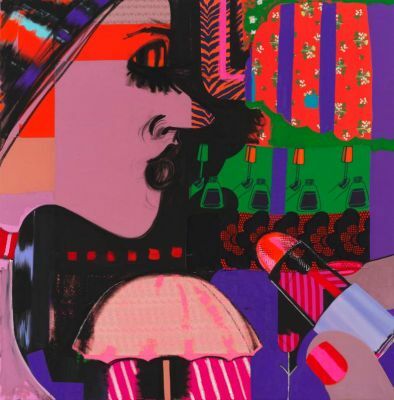 They are fleshed out through her interest in how mauve and lime green play together, in how many colors compose a velvet black vs. a polychrome lipstick tube. This constant returning to the abstraction of the very familiar suggests a path to unlocking the suggestions inherent in the forms Berkenblit repeats, why our minds insist that these particular shapes must narrate femininity, desire, and innocence so automatically. Ellen Berkenblit (b.1958) lives and works in New York and has been presented in solo exhibitions since 1984. In 2018 she has had solo exhibitions at the Drawing Center, New York; Rodolphe Janssen, Brussels; and Anton Kern Gallery, New York. In 2014 she was awarded the Guggenheim Fellowship. Her work is in several prominent public collections including the Museum of Modern Art, New York; the Whitney Museum of American Art, New York; the Brooklyn Museum, Brooklyn; and The Museum of Contemporary Art, Los Angeles. Berkenblit’s most recent group exhibitions include "WAHLVERWANDTSCHAFTEN / ELECTIVE AFFINITIES," Sammlung Friedrichshof, Austria; “Club 57: Film, Performance, and Art in the East Village, 1978-1983,” Museum of Modern Art, New York, NY; "Hope and Hazard: A Comedy of Eros," curated by Eric Fischl Hall Art Collection, Reading, VT; “Riot Grrrls,” Museum of Contemporary Art, Chicago, IL; "The Westreich/Wagner Collection," Centre Pompidou, Paris, France; “Other Planes of There” at Corbett vs. Dempsey, Chicago; “BODY/IMAGE” at Susan Inglett Gallery, New York; “Eid Ma Clack Shaw,” organized by Abby Messitte at LABSpace, Great Barrington, MA; “Ellen Berkenblit, Lee Maida, Tracy Miller” at Derek Eller, New York; “SELF: Portraits of Artists in their Absence” curated by Filippo Fossato, National Academy Museum & School, New York; and “Ellen Berkenblit, Steve DiBenedetto, Philip Hanson, Barry Le Va, Albert Oehlen, Alexander Ross, Rebecca Shore” at David Nolan Gallery, New York. She is represented by Vielmetter Los Angeles and Anton Kern Gallery in New York.